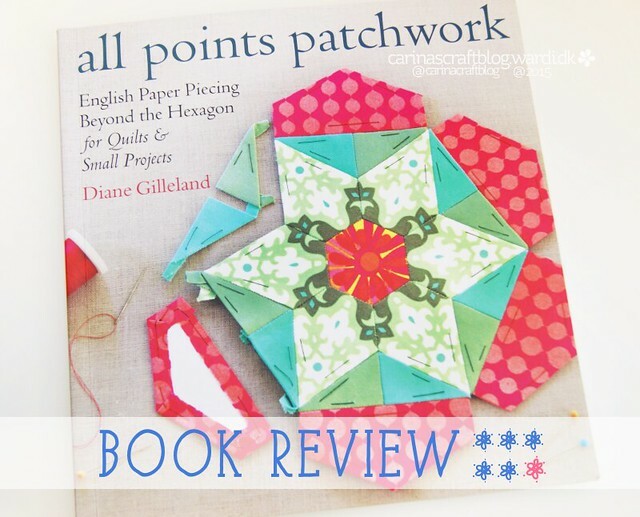 A lot of things have been put on the back burner while I worked on the book, among them a review of this book: All Points Patchwork by Diane Gilleland of Craftypod. Disclaimer: The publisher sent me a review copy. And Diane has been my internet friend for ages (in internet years, anyway!) But neither of these facts had any influence on my opinion of the book. Link to the book on Amazon UK is an affiliate link. And if you ask Santa real nice, it may just get to you in time for Christmas gift opening. 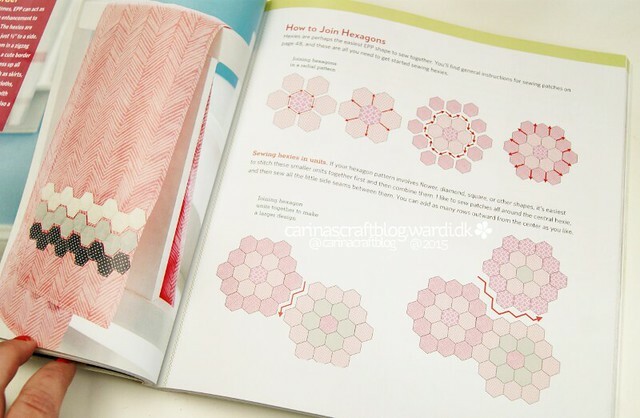 These are the main sections of the book: Tools & Materials, Basic Techniques, Building Your Own EPP Patterns. 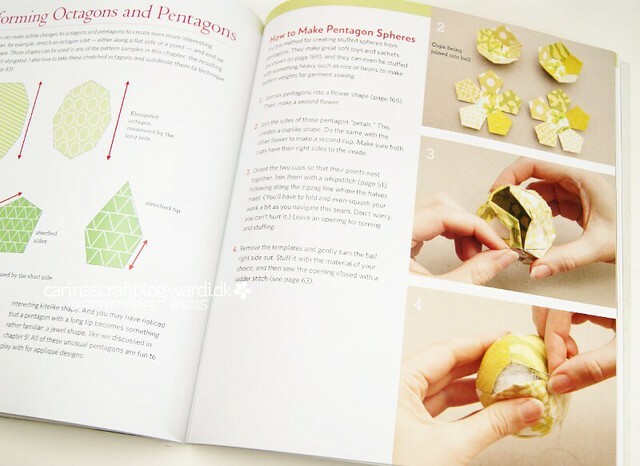 The book has separate sections for working with hexagons, diamonds & jewels, triangles & tumblers, octagons & pentagons and finally curved shapes. There is also a resources section as well as templates for various EPP shapes that you can copy and use straight away. The book is very thorough. It really goes into detail with the subject. For example, a few pages are dedicated to the pros and cons of various types of paper/card for the templates. There is advice on choosing fabrics. The tools section describes all the essential tools you need as well as nice to have optional tools. In the Basic Techniques section Diane shows how to baste the shapes and to make knots and how to sew shapes together. Even in which direction to baste the shapes. And there are further directions in each ‘shape’ chapter. 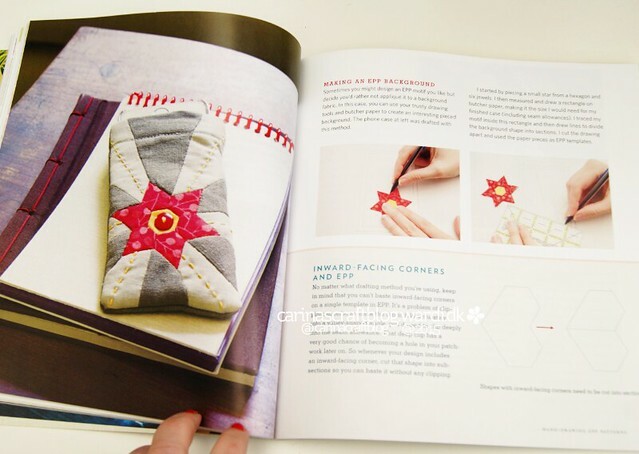 The How to Use EPP section takes a look at various ways to make projects with EPP, machine appliqué, hand appliqué, making a pieced edge and (scary!) cutting the EPP cloth to make a project. 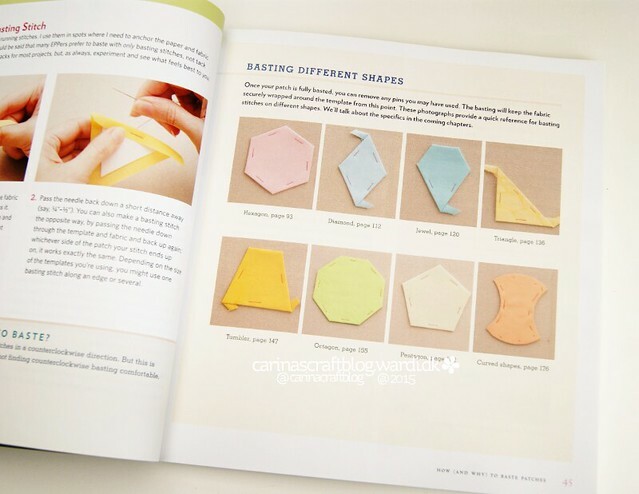 In How to Make Your Own EPP templates Diane shows you can make any shape you want and use it to make EPP. You don’t have to stick to the hexagons, diamonds or whatever. I think it’s really great to see that, I think it opens up a whole lot of other ideas for projects where you can use the EPP technique. Speaking of projects, I should point out that this isn’t a project book. 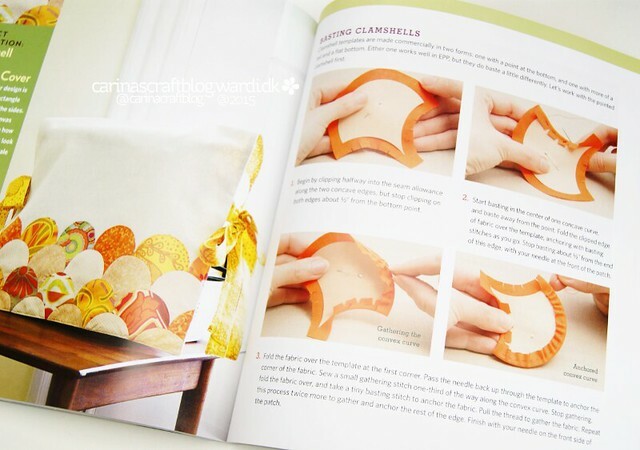 There are no templates or instructions for making the projects shown in the book. They’re only there as inspiration. 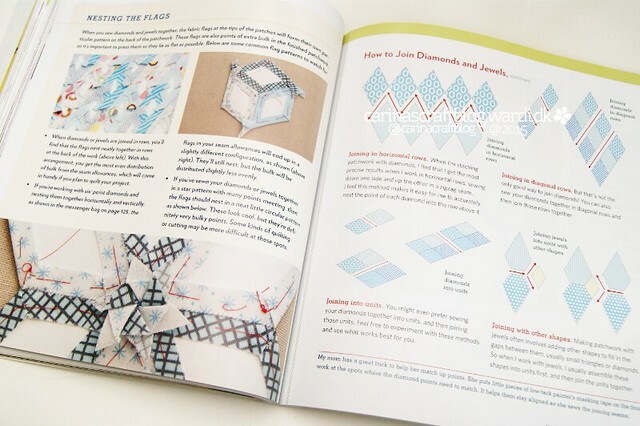 This is a technique book that will teach you the skills to make your own projects. That makes me very happy. There are far too few books that go in depth with a technique instead of just giving a cursory introduction to a subject. There are so many pretty projects in other books and on the internet, we have plenty of inspiration. Technique is what a book like this can teach us. It’s the next best thing to having Diane there to show us in person. There is so much attention to detail in this book. And it is a real confidence booster. It tells you all the basics (and way more besides! ), shows you how to trouble shoot – and avoid trouble in the first place. All the technique and advice in the book is awesome, but one thing I really love is that Diane points out that there is no ‘right’ way to do EPP. If you find a way that works for you, then that’s the right way. 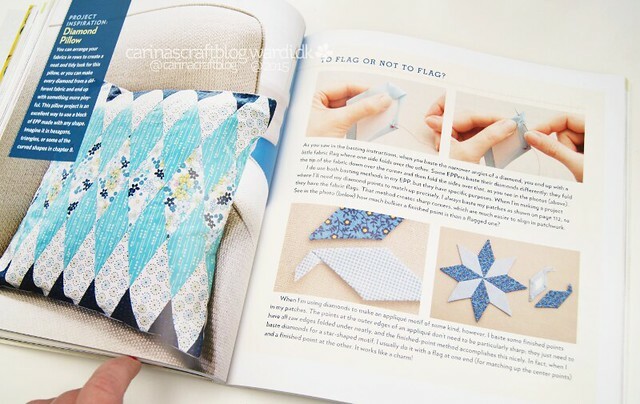 In case you missed it at the top of the post, I’ll repeat it here: this book is a fantastic EPP resource and I wholeheartedly recommend that you add it to your crafty library. So surf the interwebs over to Amazon or run to your local book shop and snag a copy! Six out of five stars! Next Post Merry merry to you!